Siri on the iPhone 4S can understand a lot of instructions. 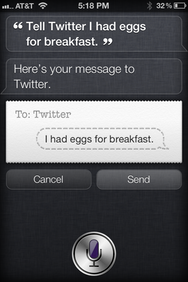 Ask the virtual assistant to send a tweet to Twitter, however, and Siri will respond that she just can’t do that. The truth is, however, she can. Here’s how: First, add a new contact on your iPhone. Make the first name Twitter, the phone number 404-04 (Twitter’s SMS shortcode), and save the contact. Next, send a text message to that number containing only the word start. You’ll get a reply with instructions on how to log into Twitter via text message. Once you finish texting your login credentials to Twitter, you can send tweets at any time by texting them to that number. That’s where Siri can help. Trigger Siri and say, “Tell Twitter, ‘Hey! I wrote this tweet using my voice!’” Siri interprets your instruction as composing a text message, and after you confirm it, will send the message to Twitter. Ta-da! Bear in mind that, by default, Twitter will now want to text you about other Twitter goings-on, like new retweets or mentions. Active Twitter users who prefer to get their Twitter notifications through other, non-text means will want to hit up their Twitter mobile settings and uncheck any unwanted options.